Jarnail Singh Bhindranwale ([dʒəɾnɛl sɪ́ŋɡ pɪ̀ɳɖɾɑ̃ʋɑɭe], born Jarnail Singh Brar) (2 June 1947 – 6 June 1984) was a militant leader of the Sikh organization Damdami Taksal. He gained prominence due to his involvement in the 1978 Sikh-Nirankari clash. He symbolized the revivalist, extremist and terrorist movement in Punjab. In 1983, to escape arrest, he along with his militant cadre occupied and fortified the Sikh shrine Akal Takht. Operation Blue Star was launched to remove him and the armed militants from the Golden Temple complex. Bhindranwale was the head of the orthodox Sikh religious school Damdami Taksal and held the title of missionary "Sant", a common religious title in Punjab. Over the period Bhindranwale grew up as a leader of Sikh militancy. There was dissatisfaction in some sections of the Sikh community with prevailing economic, social, and political conditions. Bhindranwale articulated these grievances as discrimination against Sikhs and the undermining of Sikh identity. The growth of Bhindranwale was not solely by his own efforts. In the late 1970s Indira Gandhi's Congress party supported Bhindranwale in a bid to split the Sikh votes and weaken the Akali Dal, its chief rival in Punjab. Congress supported the candidates backed by Bhindranwale in the 1978 SGPC elections. The Congress leader Giani Zail Singh allegedly financed the initial meetings of the separatist organisation Dal Khalsa. In the 1980 election, Bhindranwale supported Congress candidates. Bhindranwale was originally not very influential, but the activities of Congress elevated him to the status of a major leader by the early 1980s. This later turned out to be a miscalculation as Bhindranwale's separatist political objectives became popular among the agricultural Jat Sikhs in the region. In the summer of 1982, Bhindranwale and the Akali Dal launched the Dharam Yudh Morcha (battle for righteousness), with its stated aim being the fulfilment of a list of demands based on the Anandpur Sahib Resolution to create an autonomous state for Sikhs. Thousands of people joined the movement in the hope of acquiring a larger share of irrigation water and the return of Chandigarh to Punjab. Bhindranwale was responsible for the launching the Sikh militancy during the 1980s. Bhindranwale also increased the level of rhetoric on the perceived "assault" on Sikh values by the Hindu community. In 1982 Bhindranwale and his armed group moved to the Golden Temple complex and made it his headquarters. From inside the complex, Bhindranwale led the terrorist campaign in Punjab. In June 1984 Operation Blue Star was carried out by the Indian Army to remove Jarnail Singh Bhindranwale and his armed militants from the buildings of the Harmandir Sahib in the Golden Temple Complex. Bhindranwale died and the temple complex was cleared of militants. Bhindranwale has remained a controversial figure in Indian history. While the Sikhs' highest temporal authority Akal Takht describe him a 'martyr', most Indians view him as a terrorist. Bhindranwale was born as Jarnail Singh Brar to a Jat Sikh family in 1947 in the village of Rode, in Moga District located in the region of Malwa. The grandson of Sardar Harnam Singh Brar, his father, Joginder Singh Brar was a farmer and a local Sikh leader, and his mother was Nihal Kaur. Jarnail Singh was the seventh of seven brothers and one sister. He was put into a school in 1953 at the age of 6 but he dropped out of school five years later. He then started working with his father in the farm. He married Pritam Kaur, the daughter of Sucha Singh of Bilaspur at the age of nineteen. The couple had two sons, Ishar Singh and Inderjit Singh, in 1971 and 1975, respectively. Pritam Kaur died of heart ailment at age 60, on 15 September 2007 in Jalandhar. The Logo of the Damdami Taksal, reads 'the Shabd is forged in the True mint' in Punjabi (Gurmukhi). In 1965, he was enrolled by his father at the Damdami Taksal also known as Bhindran Taksal, a religious school, near Moga, Punjab, then headed by Gurbachan Singh Khalsa Bhindranwale. The name Bhindran Taksal was made after the village of Bhindran Kalan where its chief Gurbachan Singh Bhindranwale lived. After a one-year course in Sikh studies he returned to farming again. He continued his studies under Kartar Singh, who was the new head of the Taksal after Gurbachan Singh Khalsa. He quickly became the favourite student of Kartar Singh. Kartar Singh Khalsa died in a car accident on 16 August 1977. Before his death Kartar Singh had appointed Bhindranwale as his successor, in preference to his son Amrik Singh. Bhindranwale became the head of Taksal at a young age of thirty one. Bhindranwale was formally elected the 12th jathedar of the Damdami Taksal at a bhog ceremony at Mehta Chowk on 25 August 1977. He adopted the surname "Bhindranwale" meaning 'from Bhindran' named after the sects name Bhindran Taksal. Bhindranwale attained the religious title of "Sant", also held by around eight thousand Sikhs in Punjab. He left home and relinquished his family duty. He gave his full-time to Taksal. His family could only see him in Sikh religious ceremonies known as Satsang. As a missionary Sant of Taksal, he would tour the villages to give dramatic public sermons and reading of scripture. He preached the disaffected young Sikhs, encouraging them to return to the path of Khalsa by giving up consumerism in family life and abstaining from drugs and alcohol. His focus on fighting for the Sikh cause appealed to many young Sikhs. Bhindranwale never learned English but had good grasp of Punjabi language. His speeches were released in the form of audio cassette tapes and circulated in villages. Later on, he became adept with press and gave radio and television interviews as well. Bhindranwale symbolized the revivalist, extremist and terrorist movement in Punjab, and was responsible for the launching the Sikh Militancy. Under Bhindranwale, the number of people joining the Khalsa increased. The rhetorics that were based on the "perceived 'assault' on Sikh values from the Hindu community", also increased in this period. Bhindranwale and his friend Amrik Singh started carrying firearms at all times, this practice was defended referring to the Sikh religious value of carrying a Kirpan which is also a weapon. Bhindranwale had started, carrying in his hand a steel arrow, thereby imitating the tenth Guru Gobind Singh. From his rise in popularity in 1978, until 6 June 1984 when Bhindranwale died, Bhindranwale propagated and practised hate thorough the orthodox Sikh tenets for six years. He used "Amrit Prachar", which is the propagation of the tenets of the Sikh faith and mixed radical fundamentalism with incitement to violence. Author Khushwant Singh, summarized his ‘revelations’, that "Bhindranwale was not bothered with the subtle points of theology; he had his list of do's and don’ts clearly set out in bold letters. He took those passages from the sacred texts which suited his purpose and ignored or glossed over others that did not. He well understood that hate was a stronger passion than love: his list of hates was even more clearly and boldly spelt out". Bhindranwale rise in popularity is accredited to his alleged role as an agent of India's Congress party, particularly through his connection with former Congress CM (and later President) Zail Singh. Bhindranwale received both political and financial assistance from Congress (I) with an objective to destabilize the Akali Dal. According to Times of India, he was nurtured to cut the Akali Dal's influence. :174 According to the New York Times, Sanjay Gandhi recruited Bhindranwale after Indira Gandhi lost the Indian general election, 1977. Bhindranwale received public attention after the Nirankari clash in 1978. In 1979, Bhindranwale put up forty candidates against the Akali candidates in the SGPC election for a total of 140 seats, he won only four of the seats. A year later, Bhindranwale campaigned actively for Congress in three constituencies' during the general elections. Due to his lack of success in election politics, he later claimed he did not personally seek any political office. Zail Singh and Sanjay Gandhi were considered as the architects of the Congress party's Bhindranwale strategy. Even then Congress was unable to control Bhindranwale after coming back to power in the Indian general election, 1980. On 13 April 1978, the day to celebrate the birth of Khalsa, a peaceful Sant Nirankari convention was organized in Amritsar, with permission from the Akali state government. The practices of "Sant Nirankaris" sect of Nirankaris was considered as heretics by the orthodox Sikhism expounded by Bhindranwale. From Golden Temple premises, Bhindranwale delivered an angry sermon in which he declared that he would not allow this convention and would "go there and cut them to pieces". A procession of about two hundred Sikhs led by Bhindranwale and Fauja Singh, the head of the Akhand Kirtani Jatha, left the Golden Temple and proceeded to the Nirankari Convention. Fauja attempted to behead Nirankari chief Gurbachan Singh with his sword but was shot dead by Gurbachan's bodyguard, while Bhindranwale escaped. In the ensuing violence, several people were killed: two of Bhindranwale's followers, eleven members of the Akhand Kirtani Jatha and three members of Nirankari sect. This event brought Bhindranwale to limelight in the media. A criminal case was filed against sixty two Nirankaris, by the Akali led government in Punjab. The case was heard in the neighbouring Haryana state, and all the accused were acquitted on grounds of self-defence. The Punjab government Chief Minister Prakash Singh Badal decided not to appeal the decision. The case of Nirankaris received widespread support in the media and the orthodox Sikhs claimed this to be a conspiracy to defame the Sikh religion. Bhindranwale increased his rhetoric against the enemies of Sikhs. A letter of authority was issued by Akal Takht to ostracize the Sant Nirankaris. A sentiment was created to justify extra judicial killings of the perceived enemies of Sikhism. The chief proponents of this attitude were the Babbar Khalsa founded by the widow, Bibi Amarjit Kaur of the Akhand Kirtani Jatha, whose husband Fauja Singh had been at the head of the march in Amritsar; the Damdami Taksal led by Jarnail Singh Bhindranwale who had also been in Amritsar on the day of the outrage; the Dal Khalsa, formed with the object of demanding a sovereign Sikh state; and the All India Sikh Students Federation, which was banned by the government. In the subsequent years following this event, several murders took place in Punjab and the surrounding areas allegedly by Bhindranwale's group and the new Babbar Khalsa. 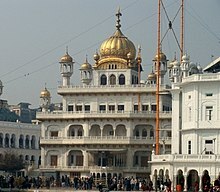 The Babbar Khalsa activists took up residence in the Golden Temple, where they would retreat to, after committing "acts of punishment" on people against the orthodox Sikh tenets. Police did not entered the temple complex to avoid hurting the sentiments of Sikhs. On 24 April 1980, The Nirankari head, Gurbachan was murdered. Bhindranwale took residence in Golden Temple to escape arrest when he was accused of the assassination of Nirankari Gurbachan Singh. Several of Bhindranwale's associates and relatives were arrested. The FIR named nearly twenty people involved in the murder, most of whom had ties to Bhindranwale. A member of the Akhand Kirtani Jatha, Ranjit Singh, surrendered and admitted to the assassination three years later, and was sentenced to serve thirteen years at the Tihar Jail in Delhi. On 9 September 1981, Lala Jagat Narain, the founder editor of the newspaper Punjab Kesari, was murdered. He was viewed as a supporter of the Nirankari sect and had written several editorials that had condemned the acts of Bhindranwale. Lala had urged Hindus of Punjab to reply to government census that Hindi and not Punjabi was their mother tongue and decried the Anandpur Sahib Resolution. Narain had been present at the clash between the Nirankaris and the Akhand Kirtani Jatha and had served as a witness in the court case of the incident. Punjab Police issued a warrant for Bhindranwale's arrest in the editor's murder. Bhindranwale at that time was present in Chando Kalan, a Haryana village 200 miles from Amritsar. The Punjab Police planned a search operation in an attempt to locate and arrest Bhindranwale on September 14, 1981. Journalist Kuldip Nayyar reported that Bhindranwale was alerted in time by intervention of the Haryana CM Bhajan Lal acting on advice of Congress Home Minister of India Zail Singh. Haryana Police reportedly allowed Bhindranwale to flee before the Punjab Police team reached Chando Kalan to arrest him. Bhindranwale abandoned his private bus and fled. There was violence in Chando Kalan when the Punjab Police team reached the location, between supporters of Bhindranwale and police. In the violence two buses owned by the Damdami Taksal were burnt. The bus contained written records of sermons of Bhindranwale for posterity. The burning of his sermons had enraged Bhindranwale and he lost his trust in his political contacts who were protecting him. After absconding for several days, Bhindranwale secured himself in his fortified Gurdwara Gurdarshan Parkash located at Mehta Chowk. The police surrounded the gurudwara at Mehta Chowk but did not make any attempt for his arrest. For negotiating Bhindranwale's surrender, the senior officers went inside the gurdwara. Bhindranwale agreed to surrender for arrest at 1:00 p.m. on September 20, 1981 but added a condition that will do so only after addressing a ‘religious congregation’. This condition was accepted by the police. At the agreed time he emerged address a large crowd of his followers who armed with spears, swords and several firearms. Several prominent Akali leaders such as Gurcharan Singh Tohra, Harchand Singh Longowal and the Delhi Gurudwara Prabandhak Committee's Jathedar Santokh Singh were present. Bhindranwale delivered a fiery sermon inciting the mob against the Government and against the alleged injustices done to the Sikhs and himself. He ended his speech asking the mob not to act violent after his arrest. Bhindranwale then surrendered himself to the police for arrest and was being taken to a circuit house (guest house) instead of prison. The mob roused by Bhindranwale's speech opened fire on the police who were taking him away. The clashes with police resulted in the death of 11 persons. On 20 September 1981, on the day of his arrest, in retaliation three armed men of his group on motorcycle opened fire using machine guns in a market in Jallandhar and killed four Hindus and injured twelve. The next day, in another incident at Tarn Taran one Hindu man was killed and thirteen people were injured. On 25 September, in Amritsar a goods train was derailed. On 29 September, an aeroplane of Indian Airlines was hijacked and taken to Lahore. Several bomb blasts were made in Punjab's Amritsar, Faridkot and Gurdaspur districts. Several violent incidents happened in Punjab during the next 25 days after the arrest. The Akali Dal under Longowal decided to support Bhindranwale. Bhindranwale also got support from the President of the SGPC, Tohra and the Jathedar of the Akal Takht, Gurdial Singh Ajnoha. India's Home Minister, Giani Zail Singh, then announced in the Parliament that there was no evidence against Bhindranwale in his involvement in Lala Jagat Narain's murder. On 15 October 1981 Bhindranwale was released by the Punjab Police. After his release he released a public statement approving the murders of Gurbachan Singh and Lala Jagat Narain and that the killers deserved to be honoured and awarded their weight in gold. The Akali Dal was initially opposed to Bhindranwale, and even accused him of being a Congress agent. However, as Bhindranwale became increasingly influential, the party decided to join forces with him. In August 1982, under the leadership of Harcharan Singh Longowal, the Akali Dal launched the Dharam Yudh Morcha ("Group for the Religious fight") in collaboration with Bhindranwale to win more autonomy for Punjab. The movement was hijacked by Bhindranwale who declared that it will continue until all the demands in the Anandpur Sahib Resolution were fulfilled. Indira Gandhi considered the Anandpur Resolution as a secessionist document and evidence of an attempt to secede from the Union of India. The resolution was made fundamental to Bhindranwale's cause as the demand for autonomy was phrased such a way that would have given more authority to the Sikhs than Hindus in Punjab. Thousands of people joined the movement as they felt that it represented a real solution to their demands, such as a larger share of water for irrigation, and return of Chandigarh to Punjab. After the launch of the Morcha, Sikh extremists began committing acts of political violence. Assassination of Chief Minister of Punjab Darabara Singh was attempted and two Indian Airlines flights were hijacked by the terrorists. By early October, more than 25,000 Akali workers courted arrest in Punjab in support of the agitation. To restart the talks with the Akali leadership, Indira Gandhi ordered the release of all Akali workers in mid October and sent Swaran Singh as her emissary. Bhindranwale who was then regarded as "single most important Akali leader" announced that nothing less than full implementation of the Anandpur resolution was acceptable to them. Other Akali leaders joined the negotiations but a compromised settlement failed to emerge. In November 1982, Akali leader Longowal announced that the Akali Dal would disrupt the Asian Games that as to be held in Delhi by sending teams of Akali workers to Delhi to protest and court arrest. To prevent the disruptions Haryana government sealed the border between Delhi and Punjab and frisking of travellers was followed. The security measures proved effective and Akali Dal could only organize small and scattered protests in Delhi. Since the early 1980s, Bhindranwale was supported by Pakistan's ISI on his radical separatist stand, plans and operations. Bhindranwale had started the efforts for his demand in 1982, and by mid-1983 had managed to gain support for his plan to divide India. ISI created a Punjab cell in the ISI headquarters to support and help him in spreading militancy in the Indian Punjab state. The arms and ammunition used by his group were provided by ISI. Terrorist training camps were set up in Karachi and Lahore to train the young Sikhs. Counter Intelligence wing of the Indian agencies had reported that three prominent heads of the Khalistan movement Shabeg Singh, Balbier Singh and Amrik Singh had made at least six trips each to Pakistan between the years 1981 and 1983. Bhindranwale stated his position on Khalistan during interviews with domestic and foreign journalists and public speeches through his phrase that "Sikh ik vakhri qaum hai" (or, "Sikhism is a distinct nation"). He used the word 'Qaum' (nation or also religion) when referring to the Sikh population of Punjab as an implicit endorsement of the Khalistan movement, a movement which was first introduced in concept during the 1946 independence negotiations. Bhindranwale was known to be a supporter of the creation of a Sikh majority state of Khalistan. In a BBC interview, he stated that if the government agreed to the creation of such a state, he would not refuse and repeat the mistakes made by Sikh leadership during the 1946 independence. Bhindranwale had said "we are not in favour of Khalistan nor are we against it". To which he added, "if the Indian Government invaded the Darbar Sahib complex, the foundation for an independent Sikh state will have been laid." The BBC reported that he was daring law enforcement to react to his actions of fortifying the Golden Temple in order to bolster support. During the days before the assault, government representatives met with Bhindranwale in a last ditch effort to negotiate a truce. Bhindranwale warned of a backlash by the Sikh community in the event of an army assault on the Golden Temple. In his final interview to Subhash Kirpekar, Bhindranwale stated that Sikhs can neither live in India nor with India. Bhindranwale's group were killing the Sikhs who had been speaking against Bhindranwale and the idea of Khalistan. In early June 1984 the intelligence sources reported that Bhindranwale was planning to declare Khalistan an independent country any moment with support from Pakistan. Khalistani currency had already been distributed. This declaration would have increased chances of Punjab Police and security personnel siding with Bhindranwale. The violence and the threat of the civil war in Punjab made the Operation imminent. Bhindranwale is alleged to have held a deep "hatred of Hindus" and made statements to incite acts of communal violence between Sikhs and Hindus. Bhindranwale preached his followers ‘If the Hindus come in search of you’, ‘smash their heads with television antennas.’ He used examples from the history related to Mughal-Sikh Wars and preached the Sikhs could do the same now with their "new oppressors". If the few Jews of Israel could keep the more numerous Arabs at bay, then even the Sikhs could and must do the same with the Hindus. Bhindranwale used vituperative language in his speeches against the Hindus. In order to solve the Hindu-Sikh problem Bhindranwale exhorted every Sikh to kill thirty-two Hindus. The individual targeted killings soon converted to massacres. In October 1983, six Hindu bus passengers were singled out and killed by the Sikh militants and an Emergency rule was imposed on the state. In June 1984, Bhindranwale was about to launch a fierce movement planned to murder Hindus in all the villages across Punjab. Plans included killings of All congress (I) MPs and MLAs on 5 June. According to Amarjit Kaur, Bhindranwale wanted to start a civil war between the Hindus and Sikhs. Before the Operation Blue Star started, there was already a rise in the killings of Hindus and 23 people were killed in the final 24 hours before the announcement of the operation. Jarnail Singh Bhindranwale had with himself a group of devoted followers armed with firearms who served as his bodyguards and acolytes. Members of his militant group often served as willing and unpaid killers. Bhindranwale urged all Sikhs to buy weapons and motorcycles, which would be helpful to fight, instead of spending on the television sets. He believed that Amritdharis (baptized Sikhs) should also be Shastradharis (weapon bearers). Bhindranwale was accused by Indian authorities and critics for being responsible for several crimes and acts of terrorism including murdering and inciting hatred toward innocent Hindus, bank robbery, home invasion, organising terrorist training camps, and stockpiling weapons. In its White Paper on Operation Blue Star, the Indian Government published statements made by Bhindranwale in an effort to illustrate his alleged intent to advocate the killing of Hindus in Punjab and to initiate a general exodus from the State for political purposes. On 12 May 1984, Ramesh Chander, Son of Lala Jagat Narain and editor of Hind Samachar group was also murdered by the militants of Bhindranwale. In addition, seven editors and seven news hawkers and newsagents were also killed in a planned attack on the freedom of media house to cripple it financially. Punjab Police had to provide protection to the entire distribution staff and scenes of armed policemen escorting news hawkers on their morning rounds became common. A few Sikh leaders raised their voice against Bhindranwale in the Golden Temple and other gurdwaras in Punjab. Among the prominent ones was Giani Partap Singh, an eighty year old spiritual leader and a former Jathedar of the Akal Takht, Partap had openly criticised Bhindranwale for stockpiling firearms and weapons in the Akal Takht. Bhindranwale's occupation of the Akal Takht was termed as an act of sacrilege. Partap was murdered with gunshot at his home in Tahli Chowk. Several other dissenters were also killed. Niranjan Singh who was the Granthi of Gurudwara Toot Sahib, Granthi Jarnail Singh of Valtoha and Granthi Surat Singh of Majauli were among those killed. People criticising Bhindranwale were perceived as his enemies who in turn were branded as enemies of the Sikh faith. The prominent members of the Sikh religion got the message being spread through the ongoing events and were afraid of personal safety. The violence incidents increased and reached its peak in the months before Operation Bluestar. The sacred Golden Temple was being defiled by the militants. An arsenal had been created within the Akal Takht over a period of several months. Trucks that were engaged for kar seva (religious service) and bringing in supplies needed for the daily langar were used for bringing in guns and ammunition into the Golden Temple. The police failed to check these vehicles, reportedly on instructions from superiors. During a random check, one truck was stopped and many sten guns and large quantity of ammunition was found. After the operation Blue Star, it was found that the militants had even set up a facility to manufacture grenade and to fabricate sten-guns inside the temple complex. At the same time, the number of murders kept increasing in the state and sometimes more than a dozen killings happened in a day. Bhindranwale gradually took over the complete control of the Golden Temple from Akali Dal. The Akali Dal along with its militant wing Babbar Khalsa contested with Bhindranwale's group for dominance. By April and May 1984 the two groups clashed reached its peak with intimidations and killings. The two groups blamed each other for several assassinations. In July 1982, the then President of Shiromani Akali Dal, Harchand Singh Longowal invited Bhindranwale to take up residence at the Golden Temple compound. He called Bhindranwale "our stave to beat the government." On 19 July 1982, Bhindranwale anticipating his imminent arrest took shelter with a large group of his armed followers, in the Guru Nanak Niwas (Guest house), in the precincts of the Golden Temple. In the chaos of Punjab, Bhindranwale developed a reputation as a man of principle who could settle people's problems about land, property or any other matter without needless formality or delay. The judgement would be accepted by both parties and carried out. This added to his popularity. Bhindranwale was reportedly backed by Pakistan's ISI on his radical separatist stand, plans and operations. Bhindranwale had started the efforts for his demand in 1982, and by mid-1983 had managed to gain support for his plan to divide India. ISI reportedly supported and helped him in spreading militancy in the Indian Punjab state. The arms and ammunition used by his group were provided by ISI. In 1982, Bhindranwale and approximately 200 armed followers moved into a guest-house called the Guru Nanak Niwas, in the precinct of Harmandir Sahib and made Golden Temple complex his headquarters. From inside the temple complex, Bhindranwale led the terrorist campaign in Punjab. Police could not pursue them inside the Golden temple premises for fear of hurting the religious sentiments of the Sikh community. From here he met and was interviewed by international television crews. On 23 April 1983, the Punjab Police Deputy Inspector General A. S. Atwal was shot dead as he left the Harmandir Sahib compound by a gunman from Bhindranwale's group. The following day, after the murder, Longowal claimed the involvement of Bhindranwale in the murder. Reportedly, militants responsible for bombings and murders were taking shelter in some gurdwaras in Punjab. Punjab assembly noted that the murder in the temple premises confirmed the charges that the extremists were being sheltered and given active support in religious places and the Guru Nanak Niwas. While Bhindranwale was openly supporting such elements. However, the Congress-led government declared that it could not enter the gurdwaras for the fear of hurting Sikh sentiments. After the murder of six Hindu bus passengers in October 1983, President's rule was imposed in Punjab. As the days went by the law and order situation further deteriorated and violence around the complex escalated. While the Akalis pressed on with their two-pronged strategy of negotiations and massive campaigns of civil disobedience directed at the Central Government, others were not so enamoured of nonviolence. Communists known as "Naxalites", armed Sikh groups – the "Babbar Khalsa" and "Dal Khalsa", sometimes worked hand in hand and clashed with the police. A covert government group known as the Third Agency was also engaged in dividing and destabilising the Sikh movement through the use of undercover officers, paid informants and agents provocateurs. Bhindranwale himself always kept a revolver and wore a cartridge belt and encouraged his followers to be armed. During the debate in the Parliament of India members of both the houses demanded the arrest of Bhindranwale. Sensing a prospect of his arrest from the hostel premises, he convinced the SGPC president Tohra to set up his headquarter in Akal Takht (Shrine representing the temporal power of God) in the Golden temple. While the move was supported by Gurcharan Singh Tohra, then President of the Gurdwara committee (SGPC), it was opposed by Harchand Singh Longowal, leader of the Akali political party. On 15 December 1983, Bhindranwale was asked to move out of Guru Nanak Niwas house by members of the Babbar Khalsa who acted with Longowal's support. Babbar Khalsa had also the support of the Congress party. Longowal by now feared for his own safety. Tohra then convinced the high priest to allow Bhindranwale to reside in Akal Takht as he had nowhere to go. 15 December 1983 Bhindranwale and his supporters moved to the Akal Takhat and began fortifying the complex with sand bags and light weaponry. Longowal attempted to block the move by persuading Giani Kirpal Singh, then Jathedar (head priest) of the Akal Takht, to use his authority and issue a Hukamnama (edict) disallowing Bhindranwale from relocating to the complex. The temple high priest protested this move as a sacrilege since no Guru or leader ever resided in Akal Takht that too on the floor above Granth Sahib but Tohra agreed to Bhindranwale's demand to prevent his arrest. In the end, while Giani Kirpal Singh did protest the move, Bhindranwale's was permitted to relocate. Bhindranwale claimed that he had to move to Akal Takht as Morcha dictator Longowal was negotiating with the government for his arrest. By December 1983, Bhindranwale and his followers had made the Golden Temple complex an armoury and headquarter for extremist activities. Mark Tully and Satish Jacob wrote, "All terrorists were known by name to the shopkeepers and the householders who live in the narrow alleys surrounding the Golden Temple... the Punjab police must have known who they were also, but they made no attempt to arrest them. By this time Bhindranwale and his men were above the law." The government contemplated military moves to arrest Bhindranwale but this would have caused numerous casualties as collateral damage, the Golden Temple being one of the most visited sites in Punjab. It would have also hurt the religious sentiments of the Sikhs. Other options such as negotiations were opted for instead. The government sent a team led by Narasimha Rao to try to convince Bhindranwale to back out but he was adamant, and refused all efforts made by the Indira Gandhi administration to negotiate a settlement. The negotiations failed and the law and order situation in Punjab continued to deteriorate. Indira Gandhi tried to persuade the Akalis to support her in the arrest of Bhindranwale peacefully. These talks ended up being futile. On 26 May, Tohra informed the government that he had failed to convince Bhindranwale for a peaceful resolution of the crisis and that Bhindranwale was no longer under anyone's control. Faced with imminent army action and with the foremost Sikh political organisation, Shiromani Akali Dal (headed by Harchand Singh Longowal), abandoning him, Bhindranwale declared "This bird is alone. There are many hunters after it". In June 1984, after the negotiations failed, Prime Minister of India Indira Gandhi ordered Operation Blue Star, an Indian Army operation carried out between 1 and 8 June 1984, to remove Bhindranwale and his armed militants from the buildings of the Harmandir Sahib complex in Amritsar, Punjab. Bhindranwale had made the sacred temple complex an armoury and headquarter. Bhindranwale was killed in the operation. According to Lieutenant General Kuldip Singh Brar, who commanded the operation, the body of Bhindranwale was identified by a number of agencies, including the police, the Intelligence Bureau and militants in the Army's custody. Bhindranwale's brother also identified Bhindranwale's body. Pictures of what appear to be Bhindranwale's body have been published in at least two widely circulated books, Tragedy of Punjab: Operation Bluestar and After and Amritsar: Mrs Gandhi's Last Battle. BBC correspondent Mark Tully also reported seeing Bhindranwale's body during his funeral. Cynthia Keppley Mahmood wrote in Fighting for Faith and Nation: Dialogues With Sikh Militants that Bhindranwale never learned English but mastered Punjabi. He was adept at television, radio and press interviews. Keppley further stated that "those who knew him personally uniformly report his general likability and ready humour as well his dedication to Sikhism". The author further states that "Largely responsible for launching Sikh militancy, he is valorized by militants and demonised by enemies and the accounts from the two divergent sources seem to refer to two completely different persons." Though journalist Khushwant Singh believed himself to be on Bhindranwale's hit list, he allowed that the Sikh preacher-become-activist genuinely made no distinction between higher and lower castes, and that he had restored thousands of drunken or doped Sikh men, inured to pornographic films, to their families, and that Operation Blue Star had given the movement for Khalistan its first martyr in Jarnail Singh Bhindranwale. In 2003, at a function arranged by the Shiromani Gurdwara Prabandhak Committee, at Akal Takhat Amritsar under the vision of president SGPC Prof. Kirpal Singh Badungar and Singh Sahib Giani Joginder Singh Vedanti, former jathedar of the Akal Takht made a formal declaration that Bhindranwale was a "martyr" and awarded his son, Ishar Singh, a robe of honour. Harbans Singh's The Encyclopedia of Sikhism describes Bhindranwale as "a phenomenal figure of modern Sikhism". ^ a b c d e f "The Sant's Son". ^ a b c d e f Singh, Sandeep. "Saint Jarnail Singh Bhindranwale (1947–1984)". Sikh-history.com. Archived from the original on 24 March 2007. Retrieved 18 March 2007. ^ "Why Osama resembles Bhindranwale". Rediff. Retrieved 22 March 2019. ^ a b c d Crenshaw, Martha (1 November 2010). Terrorism in Context. Penn State Press. p. 381. Archived from the original on 8 July 2018. Retrieved 8 July 2018. ^ Muni, S. D. (2006). Responding to Terrorism in South Asia. Manohar Publishers & Distributors, 2006. p. 36. ISBN 9788173046711. Archived from the original on 8 July 2018. Retrieved 8 July 2018. ^ a b c Fair 2005, p. 128. ^ Van Dyke 2009, p. 980. ^ a b c d e f g h Akshayakumar Ramanlal Desai (1 January 1991). Expanding Governmental Lawlessness and Organized Struggles. Popular Prakashan. pp. 64–66. ISBN 978-81-7154-529-2. ^ Stanley Jeyaraja Tambiah (1996). Leveling crowds: ethnonationalist conflicts and collective violence in South Asia. University of California Press. p. 106. ISBN 978-0-520-20642-7. ^ a b c d e f g Mahmood, Cynthia Keppley (1996). Fighting for Faith and Nation: Dialogues with Sikh Militants. University of Pennsylvania Press. p. 77. ISBN 9780812215922. Archived from the original on 8 July 2018. Retrieved 8 July 2018. ^ a b c Robert L. Hardgrave; Stanley A. Kochanek (2008). India: Government and Politics in a Developing Nation. Cengage Learning. p. 174. ISBN 978-0-495-00749-4. ^ Swami, Praveen (16 January 2014). "RAW chief consulted MI6 in build-up to Operation Bluestar". Chennai, India: The Hindu. Archived from the original on 18 January 2014. Retrieved 31 January 2014. ^ "BBC documentary 'provokes furious response from Sikhs - Times of India". The Times of India. 18 January 2010. Retrieved 11 January 2019. ^ "Akal Takht declares Bhindranwale 'martyr'". Archived from the original on 20 October 2012. Retrieved 13 April 2012. ^ Crenshaw, Martha (1 November 2010). Terrorism in Context. Penn State Press. Archived from the original on 8 July 2018. Retrieved 8 July 2018. ^ a b c d Mahmood, Cynthia Keppley (1996). Fighting for Faith and Nation: Dialogues with Sikh Militants. University of Pennsylvania Press. p. 75. ISBN 9780812215922. Archived from the original on 8 July 2018. Retrieved 8 July 2018. ^ Singh, Tavleen (14 January 2002). "An India Today-100 People Who Shaped India". India Today. Archived from the original on 20 June 2008. Retrieved 28 October 2006. ^ a b Rode, Harcharan Singh (2 June 2014). "My brother Bhindranwale". ^ "Bhindranwale's widow dead". The Tribune. 16 September 2007. Archived from the original on 8 October 2007. Retrieved 19 March 2008. ^ a b Singh, Pashaura, Michael Hawley (2012). Re-imagining South Asian Religions: Essays in Honour of Professors Harold G. Coward and Ronald W. Neufeldt. BRILL. p. 38. ISBN 9789004242371. ^ a b Deol, Harnik (2000). Religion and Nationalism in India: The Case of the Punjab. Routledge. p. 168. ISBN 0-415-20108-X. ^ Deol, Harnik (2000). Religion and Nationalism in India: The Case of the Punjab. Routledge. p. 199. ISBN 0-415-20108-X. ^ a b c d e f g h i j k l m n o Gill, K.P.S. (2008). Punjab: The Knights of Falsehood -- Psalms of Terror. Satp.org. Har Anand Publications. ISBN 978-8124113646. Archived from the original on 14 October 2017. Retrieved 29 October 2017. ^ Singh, Khushwant, A History of the Sikhs - Volume II: 1839-1988, Oxford University Press, Delhi, 1991, pp. 330-31. ^ a b c Nayar, Kuldip (2012). Beyond the Lines: An Autobiography. Roli Books. ISBN 9788174368218. ^ Crenshaw, Martha (1 November 2010). Terrorism in Context. Penn State Press. p. 382. ^ Singh, Khushwant (2005). A History of the Sikhs: Volume II: 1839-2004. New Delhi: Oxford University Press. p. 332. ISBN 0195673093. ^ Mahmood, Cynthia Keppley (1996). Fighting for Faith and Nation: Dialogues with Sikh Militants. University of Pennsylvania Press. p. 78. ISBN 9780812215922. Archived from the original on 8 July 2018. Retrieved 8 July 2018. ^ a b c d e Guha, Ramachandra (2008). India After Gandhi: The History of the World's Largest Democracy (illustrated, reprint ed.). Excerpts: Macmillan. ISBN 9780330396110. Retrieved 10 July 2018. ^ Tully, Mark; Jacob, Satish (1985). Amritsar: Mrs. Gandhi's Last Battle. p. 59. ^ Mitra, Chandan (15 December 2011). "Bhindranwale's rise from a small-time priest was meteoric". India Today 35th anniversary. India Today. Archived from the original on 6 July 2018. Retrieved 6 July 2018. ^ a b c d e f g h Mahmood, Cynthia Keppley (1996). Fighting for Faith and Nation: Dialogues with Sikh Militants. University of Pennsylvania Press. p. 79. ISBN 9780812215922. Archived from the original on 8 July 2018. Retrieved 8 July 2018. ^ Cynthia Keppley Mahmood, Fighting for Faith and Nation: Dialogues with Sikh Militants, Philadelphia, University of Pennsylvania Press, 1996, pp. 58–60; Gopal Singh, A History of the Sikh People, New Delhi, World Book Center, 1988, p. 739. ^ Singh (1999), pp. 365–66. ^ a b c d e f g h i Gill, K.P.S. and Khosla, S (2017). Punjab: The Enemies Within : Travails of a Wounded Land Riddled with Toxins. Excerpt: Bookwise (India) Pvt. Limited. ISBN 9788187330660. Archived from the original on 21 June 2018. Retrieved 8 July 2018. ^ Sandhu, Ranbir S. (May 1997). "Jarnail Singh Bhindranwale – Life, Mission, and Martyrdom" (PDF). Sikh Educational and Religious Foundation. Archived from the original (PDF) on 29 May 2008. Retrieved 10 March 2008. ^ Jalandhri, Surjeet (1984). Bhindranwale. Jalandhar: Punjab Pocket Books. p. 25. ^ a b c Mark Tully, Satish Jacob (1985). Amritsar; Mrs. Gandhi's Last Battle (e-book ed.). London. p. 259. Archived from the original on 6 July 2018. Retrieved 8 July 2018. ^ Mark Tully, Satish Jacob (1985). Amritsar; Mrs. Gandhi's Last Battle (e-book ed.). London. p. 262. Archived from the original on 6 July 2018. Retrieved 8 July 2018. ^ Mark Tully, Satish Jacob (1985). Amritsar; Mrs. Gandhi's Last Battle (e-book ed.). London. p. 264. Archived from the original on 6 July 2018. Retrieved 8 July 2018. ^ Mahmood, Cynthia Keppley (1996). Fighting for Faith and Nation: Dialogues with Sikh Militants. University of Pennsylvania Press. p. 81. ISBN 9780812215922. Archived from the original on 8 July 2018. Retrieved 8 July 2018. ^ a b c d e Singh, Tavleen. "Prophet of Hate:J S Bhindranwale". India Today. Archived from the original on 20 June 2008. Retrieved 22 December 2009. ^ a b c d e Chima, Jugdep S (2008). The Sikh Separatist Insurgency in India: Political Leadership and Ethnonationalist Movements. SAGE Publications India. pp. 71–75. ISBN 9788132105381. Retrieved 19 August 2018. ^ Sanjay Sharma (5 June 2011). "Bhajan Lal lived with 'anti-Sikh, anti-Punjab' image". The Times of India. Retrieved 26 December 2011. ^ a b c Kiessling, Hein (2016). Faith, Unity, Discipline: The Inter-Service-Intelligence (ISI) of Pakistan. Oxford University Press. ISBN 9781849048637. Retrieved 14 September 2018. ^ a b c d e "34 Years On, A Brief History About Operation Bluestar, And Why It Was Carried Out". NDTV. 6 June 2018. Archived from the original on 5 July 2018. Retrieved 5 July 2018. ^ Raman, B. The Kaoboys of R&AW: Down Memory Lane. Lancer Publishers LLC. ISBN 9781935501480. Retrieved 14 September 2018. ^ Sandhu (1999), p. LVII. ^ "Player – 1984: Troops raid Golden Temple". BBC News. 6 June 1984. Archived from the original on 13 November 2012. Retrieved 9 August 2009. ^ Walia, Varinder. "Man who made efforts to avert Op Bluestar is no more" Archived 29 August 2008 at the Wayback Machine, "Tribune India", Amritsar, 18 December 2007. ^ Mark Tully, Satish Jacob (1985). Amritsar; Mrs. Gandhi's Last Battle (e-book ed.). London. p. 555. Archived from the original on 6 July 2018. Retrieved 8 July 2018. ^ a b c Kaur, Amarjit (2004). The Punjab Story. Lotus. ISBN 9788174369123. Retrieved 13 July 2018. ^ Amberish K Diwanji (3 June 2004). "'Pakistan would have recognised Khalistan'". The Rediff Interview/Lieutenant General Kuldip Singh Brar (retired). Rediff.com. Archived from the original on 29 January 2009. Retrieved 23 January 2009. ^ Amritsar: Mrs Gandhi's last battle by Mark Tully. Pan in association with Cape, 1986. p.35 ISBN 978-0-330-29434-8. ^ a b Singh, Khushwant (2015). Why I Supported the Emergency. UK: Penguin. ISBN 9788184752410. Archived from the original on 13 July 2018. Retrieved 13 July 2018. ^ a b Martin, Gus (2011). The SAGE Encyclopedia of Terrorism (Second ed.). SAGE Publications. p. 544. ISBN 9781483305646. Archived from the original on 13 July 2018. Retrieved 13 July 2018. ^ Mark Tully, Satish Jacob (1985). Amritsar; Mrs. Gandhi's Last Battle. London. p. 408. ^ Government of India (1984). "White paper on the Punjab agitation", p. 2. Government publication, National government publication. ^ Government of India (1984). "White paper on the Punjab agitation", p. 164. Government publication, National government publication. ^ Pachauri, Pankaj (15 August 1989). "Terrorists adopt new strategy to intimidate media in Punjab". India Today. Archived from the original on 14 July 2018. Retrieved 13 July 2018. ^ Crenshaw, Martha (1 November 2010). Terrorism in Context. Penn State Press. p. 385. Archived from the original on 8 July 2018. Retrieved 8 July 2018. ^ Khushwant Singh, A History of the Sikhs, Volume II: 1839–2004, New Delhi, Oxford University Press, 2004, p. 337. ^ Khushwant Singh, "The Genesis," The Punjab Crisis: Challenge and Response, Abida Samiuddin, ed., Delhi, K.M. Mittal, 1985, p. 98; Lt. Gen. J.S. Aurora, "If Khalistan Comes – The Sikhs will be the Losers", Punjab – The Fatal Miscalculation: Perspectives on Unprincipled Politics, eds. Patwant Singh and Harji Malik, New Delhi, Patwant Singh, 1984, p. 140. ^ Bhanwar, Harbir Singh. "Interview". ABP News. Archived from the original on 26 July 2018. Retrieved 7 June 2018. ^ Longowal said "Whenever the situation becomes ripe for settlement, some violent incident takes place. Longowal was of course not on the side of Bhindranwale and so he accused him. I know Bhindranwale is behind the murder of the DIG", "(The person behind the murder is) The one who is afraid of losing his seat of power" - but there was no proof nor a verification for it. Indian Express. 27 April 1983. interview with Longowal. ^ Mark Tully, Satish Jacob (1985). Amritsar; Mrs. Gandhi's Last Battle (e-book ed.). London. p. 393. ^ Clarence Augustus Martin, ed. (2011). The SAGE Encyclopedia of Terrorism, Second Edition. SAGE Publications. pp. 544–. ISBN 978-1-4129-8016-6. ^ Gopal Singh, A History of the Sikh People, New Delhi, World Book Center, 1988, pp. 755–56; Zuhair Kashmiri and Brian McAndrew, Soft Target: How the Indian Intelligence Service Penetrated Canada, Toronto, James Lorimer and Company, 1989, pp. 93, 130; Singh (1999), p. 366-67, 373, 398. ^ Singh (1999), pp. 380–81, 387–88. ^ a b c d Mark Tully, Satish Jacob (1985). Amritsar; Mrs. Gandhi's Last Battle (e-book ed.). London. p. 405. Archived from the original on 6 July 2018. Retrieved 8 July 2018. ^ Khushwant Singh, A History of the Sikhs, Volume II: 1839–2004, New Delhi, Oxford University Press, 2004, pp. 339–40; Gopal Singh, A History of the Sikh People, New Delhi, World Book Center, 1988, p. 753. ^ a b "Sikh Leader in Punjab Accord Assassinated". LA Times. Times Wire Services. 21 August 1985. Archived from the original on 29 January 2016. Retrieved 14 June 2018. ^ Mark Tully. Amritsar Mrs. Gandhi's Last Battle (pp. 138). ^ a b Sandhu, Ranbir S. (May 1997). Sant Jarnail Singh Bhindranwale – Life, Mission, and Martyrdom (PDF). pp. 57–58. Archived (PDF) from the original on 4 March 2016. Retrieved 22 June 2018. ^ a b Brar, K. S. (1993). Operation Blue Star: The True Story. New Delhi: UBS Publishers. p. 114. ISBN 81-85944-29-6. ^ Kaur, Naunidhi (23 June 2001). "The enigma of Bhindranwale". Frontline. Archived from the original on 21 February 2007. Retrieved 17 March 2007. ^ Akbar, M. J. (1996). India: The Siege Within: Challenges to a Nation's Unity. New Delhi: UBS Publishers. p. 196. ISBN 81-7476-076-8. ^ a b c Keppley, Cynthia (1997). Fighting for Faith and Nation: Dialogues With Sikh Militants. University of Pennsylvania Press. p. 77. ISBN 0-8122-1592-3. ^ Khushwant Singh, "I Felt I Should Reaffirm My Identity as a Sikh," The Punjab Crisis: Challenge and Response, Abida Samiuddin, ed., Delhi, K.M. Mittal, 1985, p. 320; Khushwant Singh, A History of the Sikhs, Volume II: 1839–2004, New Delhi, Oxford University Press, 2004, pp. 329–30. ^ Singh (1999), p. 378. ^ "Takht accepts Bhindranwale's death". The Tribune. 6 June 2003. Archived from the original on 30 September 2007. Retrieved 25 June 2007. ^ Major Gurmukh Singh (retd.). "JARNAIL SINGH BHINDRANVAL, SANT (1987-1994)". Encyclopaedia of Sikhism. Punjabi University Patiala. Archived from the original on 29 July 2017. Retrieved 24 August 2017. Tully, Mark; Satish Jacob (1985). Amritsar: Mrs Gandhi's Last Battle. London: Jonathan Cape. ISBN 0-224-02328-4. This page was last edited on 19 April 2019, at 08:26 (UTC).